Mommas & Mimosas: I've Had Enough and the Fitbit is the First Thing to Go. I've Had Enough and the Fitbit is the First Thing to Go. Enough talk about finding "purpose," "meaning," or even myself. Enough aimless searching for what I should be doing and more just being. Enough wasting time in the pursuit of stuff. Enough working for that stuff. More having that stuff work for me. Enough searching for articles, helpful hints, boxes and bins to organize my stuff. Less stuff and more gratitude for the stuff I truly treasure. 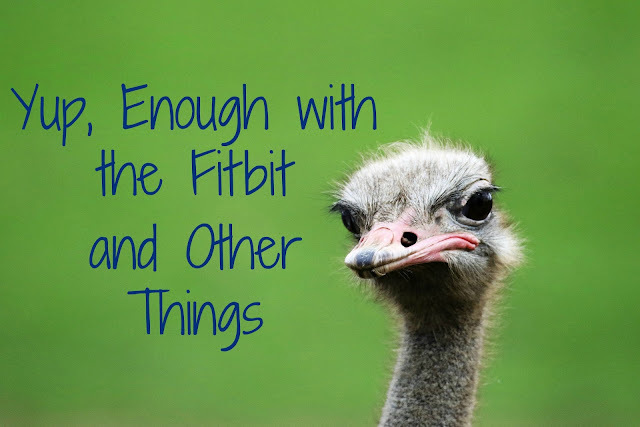 Enough with my Fitbit telling me what I "should" be doing or how I'm doing. More enjoying whatever form of exercise I choose to do. Enough worrying about whether I am parenting the "right" way. More really listening to what my children think of the world and learning from them. Enough worrying about how my kids appear to others and let's be real - whether or not people think I am a "good" parent, and more accepting that my children will make make mistakes and bad choices, and helping them learn from those mistakes while the consequences are still relatively small. Enough schlepping kids to too many activities. More unstructured time and more time being bored. Enough of just me taking on the endless cycle of laundry, dishes and house care alone. More sharing that with the people who live here too. Enough looking for more time and complaining there isn't enough time. Enough lists that are a mile long and never ending. More of just letting some stuff go. Enough saying "yes" to things without thinking or to be nice then regretting it afterwards. Enough worrying about what other people think of me instead of worrying what I think of me. More "Thanks, but no thanks"
Enough comparing myself to others in any way on any venue whether it be a glossy magazine, Instagram or Facebook. Enough watching, reading, listening to bad news that makes me feel helpless, angry, frustrated. Just enough of worrying about things I can't control. More acting on the things I can control. Enough waiting for someday to read, write, learn to draw, paint, travel. More just doing it now. Enough of letting the "should's" dictate how I spend my day and more listening to the "wants" and not feeling guilty about it. I imagined I only had 5 years left to live. That's how I cam up with this list, and it's only a start. Imagine you only had 5 years left to live, what would you change? Do you think you would protect your precious time a little more fiercely? Who would you want to spend as much time as possible with? Would you listen to your loved ones a little more closely trying to learn everything you could about them, genuinely curious about their day, their thoughts, their dreams? Would you prepare your children now with skills that they will need to live in a world without you? What would you want to see or learn or do? What would you want to share with others? What legacy would you want to leave? Maybe you can't quit your job or start a new dream job (yet) because you still have responsibilities, bills, etc., but what changes could you make if you only had 5 years left to live? It's depressing and unpleasant to think of dying, and we push uncomfortable things away to deal with another time. Yet, another time never arrives until it's too late. If you're over 40, your life is half over. Half over. That's depressing. That's uncomfortable, but its a reality. Another reality is you may have less time. Do you know what's even more depressing and uncomfortable? Regret. So, I am saying "enough" to a whole lot so I can say "Yes" to the 4 or 5 things that truly are the most important to me. I started with the Fitbit. As I was looking at another failed day of not reaching my goal, I just decided that I didn't need one more thing telling me what I should do or grading me on how I am doing. It's a small step, but after a weekend without it, I already feel better. How many other things do I do without noticing? This one small change lightened a load I didn't know I was carrying. I can't wait to see what happens as I continue to pare down the crazy in my life.